Up and down the UK, football clubs are the beating hearts of small, working-class communities. Of course, some Premier League clubs see their fans as nothing more than breathing cash machines, but there are still clubs at all levels of football in the country that haven’t forgotten the most important part of the working man’s game: the fans. A football club that people truly feel is their own can give communities that face hardship some much-needed pride. Sadly, this is rarely the case in Việt Nam. Clubs here change their names and locations for a sniff of a new sponsorship deal, and only the national team and foreign club sides elicit large and passionate followings. Phù Đổng FC though, are different, and may be changing the way football runs in Việt Nam. 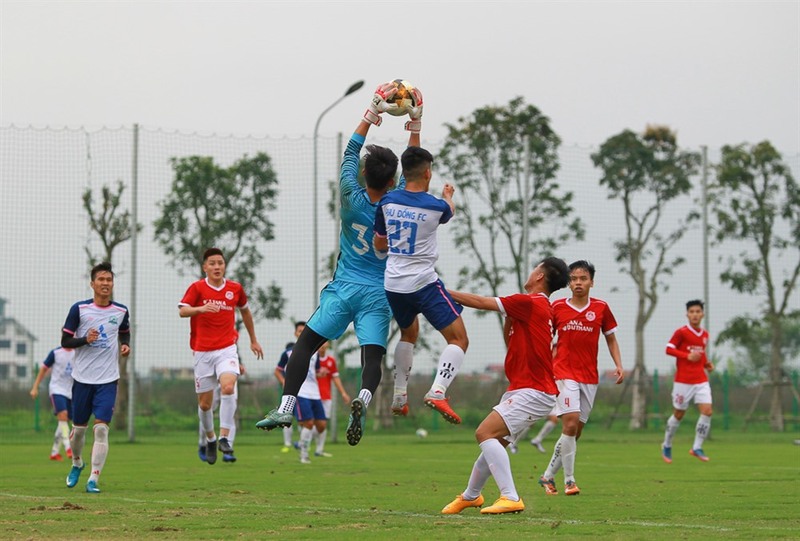 Though the club was only formed in 2015, Phù Đổng FC have enjoyed a meteoric rise up the Vietnamese football pyramid, winning successive promotions the last two seasons to arrive in the second tier V.League 2 for the 2019 season, which begins next weekend. Struggle: A Phù Đổng FC player challenges the Phố Hiến goalkeeper for the ball. Heroic: Phù Đổng FC logo. It’s not success that makes this club unique though. Phù Đổng FC is a community-based club, where supporters can become members for a mere VNĐ150,000 (US$6.50). This is in stark contrast to the norm for professional football in Việt Nam, where clubs are entirely backed and run by wealthy presidents and sponsors, with naming rights to the club itself often given to the company fronting the most cash. Membership doesn’t entitle supporters to vote on key decisions or the leadership of the club, which differs from the likes of Spain’s Barcelona FC and Northern Ireland’s Crusaders FC, but instead gives them discounts on tickets, club merchandise and products and services offered by the club’s sponsors. While the five founders of Phù Đổng FC own and operate the club, keeping rank and file supporters in mind when making decisions aims to ensure long-term stability, something that football clubs in Việt Nam struggle with. 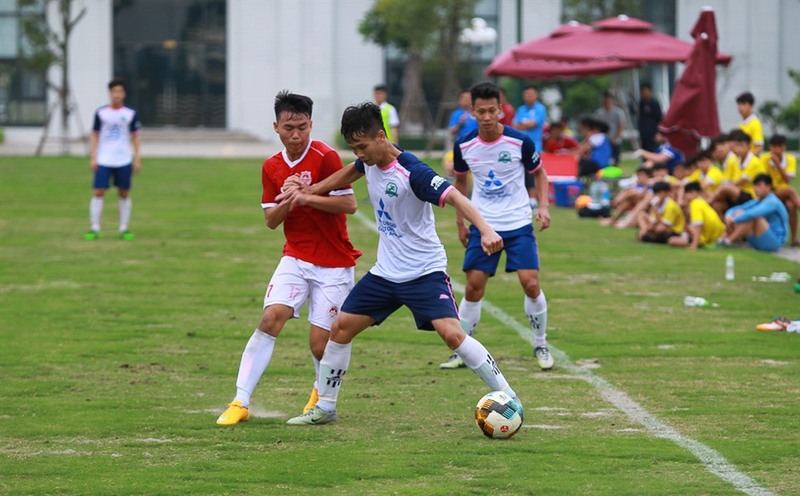 Mere weeks ago, rumours swirled that Phù Đổng FC’s V.League 2 rivals Bình Định FC would be unable to compete this season due to a lack of finances, forcing the club to issue a statement to the contrary. Even more jarringly, a team then known as Hà Nội FC chose to relocate to HCM City in the middle of the 2016 season as most of the club’s shareholders resided in the city, more than 1,000km to the south. Thanks to Phù Đổng FC’s commitment to its fans and how it relies on them for membership fees, supporters can rest assured their club won’t abandon them overnight, even if they can’t elect new leadership. Count top Vietnamese football pundit Vũ Quang Huy among those in favour of the Phù Đổng FC model. The VTC commentator attended a recent ceremony at the club’s new home of Mỹ Đình Stadium to announce Mitsubishi Motors Việt Nam would be sponsors for a third consecutive season, and expressed his support for the membership model. Huy said involving the community in the club and spreading the investment around would create stability and allow for steady growth. “Vietnamese people love football, so this type of method is ripe for success,” he added. 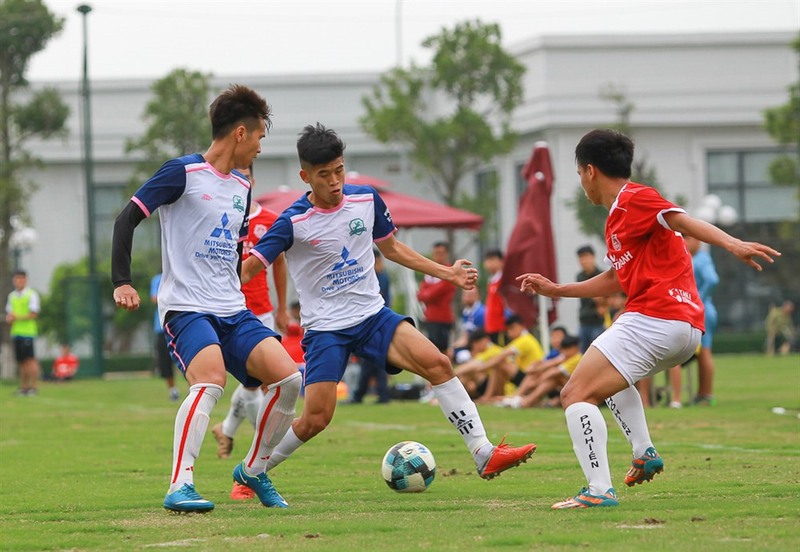 This passion for football and the community is what led club chairman Nguyễn Xuân Vũ and four others to form Phù Đổng FC, according to managing director Phạm Duy Vinh. The “love and support” from club leadership for the fans helps attract supporters like Nguyễn Thị Phương Linh, who said she could clearly “see the solidarity between people of the club”. So with a board, roughly 5,000 members and other supporters to keep happy, the pressure is on for manager Lê Đức Tuấn, and he knows it. The fiery former national U23 defender joined Phù Đổng FC as a player-coach in 2016, before retiring from playing and taking the managerial reins the following year. While he’s led the club to back-to-back promotions, Tuấn is under no illusions about the difficulty of securing a coveted V.League 1 spot. “The first goal this year is to avoid relegation and if there’s an opportunity, go for promotion,” he said at the ceremony. Chipping in: The community-based model is a unique one for football in Việt Nam. While Tuấn said he liked the fact that Phù Đổng FC’s model means the club won’t collapse if one backer falls into financial problems, the 39-year-old admitted having thousands of invested members to answer to heaped the pressure on him. Before joining Phù Đổng FC, Tuấn captained V.League 1 side Thanh Hóa and in 2018 he helped secure the signing of the club’s current captain from his old side, defender Lưu Văn Hương. The 32-year-old said the club’s structure and his connection with Tuấn helped convince him to drop down two levels last season, but the main reason was the potential he saw in the club. The opportunities to progress at the club are plain to see and best embodied in assistant coach Hoàng Sơn Tùng, who transitioned into coaching after playing for Phù Đổng FC in their very first season. Tùng said the club had come on leaps and bounds over the past four years in terms of professionalism, illustrated by the move to Mỹ Đình after years of nomadic use of various smaller stadiums around Hà Nội. Battle: A Phù Đổng FC player (left) fights for the ball against U22 Việt Nam in a recent friendly. It’s fitting that Phù Đổng FC’s name and crest is inspired by a mythical folk hero. Phù Đổng Thiên Vương is one of the ‘Four Immortals’ worshipped by the Vietnamese people, and legend has it the great warrior rode an iron horse while leading them to victory over invaders from China. The god is also a symbol for self-reliance – a quality at the core of Phù Đổng FC and one other clubs in Việt Nam should aspire to. About 15 years ago, my team back in Northern Ireland almost went out of existence, and if it hadn’t been for working-class supporters reaching into their own pockets to throw the club a financial lifeline, Crusaders wouldn’t exist today. Since then the club has enjoyed the most successful period in its history, which wouldn’t have been possible without the club’s dedicated supporters and members.